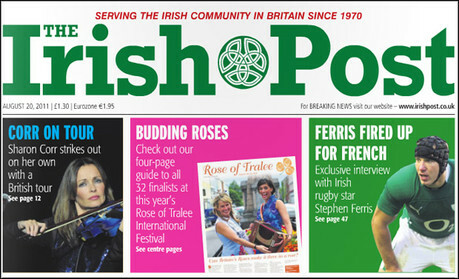 One of the main papers of the Irish in Britain, the Irish Post, has recently closed down. This article by Paul O’Donovan is appearing in today’s Press Gazette. I agree with the importance of the points raised. I published articles in the paper about the need to vote against the BNP when I was a European election candidate in 2009 and also more recently on other issues when I was a general election candidate in Vauxhall. Can the Irish Post be saved? It is almost 18 months to the day since the great and the good of the Irish community sat down for a celebratory meal to mark the 40th anniversary of the Irish Post. Now,Thomas Crosbie Holdings, the owners of the Irish Post, have announced that it will cease trading, with the loss of 12 jobs. So what went wrong? The Irish Post was founded in 1970 by journalist Breandan MacLua and accountant Tony Beatty. It was the height of the Troubles in Northern Ireland which had by then extended to Britain. Irish living in England, Scotland and Wales felt part of a suspect community, every time a bomb went off in Britain eyes seemed to turn to those people of Irish descent, staffing the hospitals, working in the schools and building the roads. The British establishment media ran government propaganda about the Troubles, two feuding tribes with the army trying to keep the peace between them. The Irish community needed a voice. It was the Irish Post that came to provide that voice under the stewardship of Brendan MacLua and later editor Donal Mooney. The staff worked hard to bring out a high quality product that gave the Irish a voice. It told the truth of what was going on in the north of Ireland and campaigned relentlessly on injustices such as the Birmingham Six, Judy Ward and the Guildford Four. Later it played a significant role in bringing to wider attention cases like those of John Mathews, who would otherwise have become the new miscarriage of justice victims. The paper also covered other aspects of the community, the cultural side with events like Irish dance,the language, poetry and sport. There were other needs like those of the elderly, the homeless and prisoners. The Irish were strong in the trade union and labour movements - this was reflected in the paper. The Irish Post worked, it performed a public service and turned a healthy profit. The paper continued to prosper. Somewhat ironically it was the ending of the Troubles that spelled some problems. The Troubles meant that events in the north of Ireland dominated much of the national news agenda over 30 years. They transported what was otherwise, for the British media, a regional backwater to become the dominant national news story. As peace took hold, news from the north subsided to regional status as far as the national media were concerned. It also provided less of a focus for the Irish Post. The paper adjusted covering much news from the Republic, as well as focusing on more peaceful matters in Britain. The paper continued to campaign, covering the deaths of Irish prisoners in Brixton prison and surprisingly for some the abuse of British soldiers in barracks. The deaths at Deepcut and other barracks featured early in the pages of the paper. The readership, though ageing, remained loyal. Executives at the paper looked to draw in the new generation of younger Irish emigrants coming to work in Britain. This was a difficult ground for the Irish Post to crack, it did not seem a natural buy for this computer literate generation. A big break came with Ken Livingstone's election as Mayor of London. Livingstone had always been loyal to the Irish community, playing his own part in the past at exposing injustices. So when elected, he introduced the St Patrick's Day parade in London. The Irish Post under new editor Norah Casey became a key player, gaining much needed public profile. The event has grown and the Irish Post prospered from the association. The ownership of the paper has changed hands twice, first being bought by Jefferson Smurfitt and then by Thomas Crosbie Holdings for £1.3 million in 2003. Sadly, sales have been on the decline, going from around 30,000 a decade ago to around 17,000 today. The paper though has continued to serve the community, providing a cohesion and space for its issues. The paper championed the Federation of Irish Societies (FIS) campaign to get the Irish to register for the census earlier this year. A couple of years ago the paper gave much coverage to the dangers to the Irish of proposals effecting British citizenship. The paper has provided one of the few fair voices on the plight of Irish travellers and prisoners. There have been problems. There has been a tendency at time to duplicate the role of papers like the Irish Times and Independent, producing Irish news for the Irish in Britain. Why would they buy the Post to get what was available elsewhere, the niche always has to be the affairs of the Irish in Britain and how they relate to the mother country. The steady hand of a McLua or Mooney has clearly been seen lacking in coverage of issues like the Catholic Church and the relationship with the British Crown. There seems to be something of an identity crisis at the paper regarding these issues, but then that maybe true of the Irish generally so in a sense again the paper is only reflecting its constituency. What is certain is that there should be a future for the newspaper. There would be some restructuring required, moving out of the expensive rented accommodation in Hammersmith to a more humble abode. Maybe some sharing of other functions with similar players in the field. There will also need to be a recognition of who the readership are and what the paper is for. The readership is ageing but surely the money of a 65 year old is just as good as that of the 25 year old? A group led by the Federation of Irish Societies and made up of Irish Post management and staff members and supporters in the wider Irish community is now seeking to save the paper. “The Federation of Irish Societies will do all we can to defend our community interest in the Irish Post; contributing to drawing up a realistic rescue plan and seek potential backers from the business community. In this, we will work with and seek support from the Irish Embassy, members of the All Party Parliamentary Group on the Irish in Britain and politicians throughout the Irish Diaspora,” said Jennie McShannon, chief executive of the Irish Post. The loss of the Irish Post would represent a sad day. The Irish make up the second largest ethnic minority group in the UK today, and as the past teaches they need a voice for their issues. Let’s hope that the ongoing effort to save this once great institution prove successful so that that voice is not lost forever. Joseph Healy stood as the Green Party's Parliamentary Candidate for Vauxhall at the last general election. Joseph was also Number 4 on the Green Party's European list in London. He was Male Co-Convenor of Green Left, the ecosocialist, anti-capitalist platform within the Green Party, for two years and was the Secretary for the last year. He is an officer of Coalition of Resistance, the leading anti-cuts campaigning organisation. He resigned from the Green Party this February in protest against the Green Council in Brighton & Hove voting through budget cuts. He has also been recently elected as the Treasurer of Queers Against the Cuts. He was also the Green Party's delegate to the Stop the War Coalition and an active anti-war campaigner. He is an active trade unionist and a member of UNITE. He was working for four years as director of a Pan London disability charity in Brixton (Transport for All) campaigning for better accessible transport for disabled people and is himself disabled. He currently works for Lambeth's main disability organisation, Disability Advice Service Lambeth on a part time basis. After having been Vice Chair of the London Ambulance Service Patients Forum, the largest public and patient involvement group in the NHS, he was elected Chair in 2010 and re-elected Chair in 2011. He was also active as a pioneer in the LGBT rights movement in the Irish Republic in the 70s and early 80s and has campaigned strongly in London on issues connected with HIV and health. Joseph lives in Camberwell with his partner and his cat.